I’m gutted, literally gutted. At the end of two brilliantly uplifting weeks of having My Little Sister (who happens to have Down’s syndrome) screened at IYAF. Thousands of pounds worth of my film equipment that’s taken me years to save up for and get, including hard drives with irreplaceable footage were stolen from our family car. I had everything of any value in the car as we were on our way to my sister’s flat so I could edit a weeks worth of vlogging for my last seven vlogs of the festival. It was Sunday the last day of the festival and really hot so we stopped off at a swimming pool in Chiswick first. 45 minutes later our car had been raided, as well as personal stuff like bags, purses and phones, my filmmaking equipment with all the accompanying kit which had taken me years to build up was gone. Cameras, all my memory cards, hard drives…ouch it hurts too much thinking of all that footage and what I was going to do with it…as well as all the little stuff which costs a fortune to accumulate your spares and back-ups of… batteries, camera cases, chargers, memory cards, tripods, sound recorder, leads…. It’s such a shock, this is my life. I had saved up through walking friends dogs several times a week and put everything into getting my kit together. As for the footage I had so much on me, as well as loads of My Little Sister…from 2013 on the hard drive that I was emptying my memory cards down onto each night after shooting at the festival. I had just shot footage at the private view of Heart & Sold latest exhibition before it went to New York, interviewing some great new artists, which I was about to make into another documentary. This was a feat in itself getting into central London on the hottest day of the year with public transport striking…so all of that gone. All the footage of the second week of vlogging at IYAF, where I was interviewing inspirational youth arts from around the world…there were 14 vlogs partially edited, all gone. There was also the footage of the My Little Sister….screenings, interviews with artists and presenters, me talking on a film biography panel with Mo Ali and Jassa Ahluwalia, being presented with my ‘Best of IYAF under 17 production’ Award and much more…Just devastated. SO, please keep your eyes peeled around Hammersmith and beyond for any dumped hard drives/memory cards/odd bits of camera equipment/bags. And please keeo sharing these appeals that ITV news, the press have put out as well as my Agi K agnieszkaproductions facebook appeal. Photo of I.T.V. 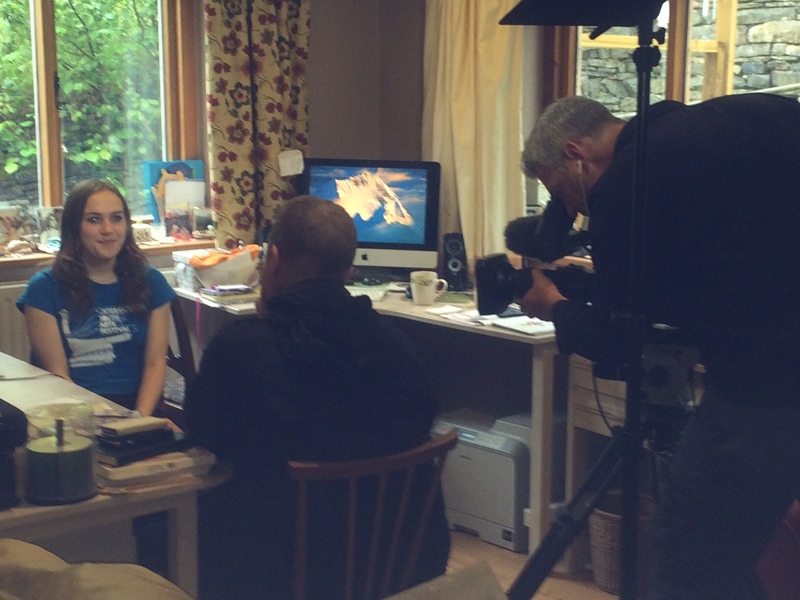 Wales News who came to interview me and their news broadcast below. It feels like being kicked in the stomach, but I won’t let it stop me film making, although I obviously can’t film at the moment without my kit. I’m still hopeful that with the appeal on facebook and the press coverage and I.T.V. News interviewing me this week, that someone will find the external hard drive and memory cards and return them. Thank you so much for all the press coverage, the FaceBook shares and all the emails of encouragement, really does mean a lot. The recordings are irreplaceable but with your help the filming kit can be replaced.